IndyWatch SEQ Food and Garden Feed Today. IndyWatch SEQ Food and Garden Feed was generated at Brisbane QLD IndyWatch. No food today. Just cats. Yesterday, the 16th of February, was Dim Sim's 19th birthday. She spent the days as she always does, snoozing in her chair cave while having food brought to her. And then we snuggled all night. I hope I have many more years to spend with her. Today is the two year anniversary of Sahara's passing. How has it already been two years? I don't know. I miss her so much. She was such a bright, enthusiastic, energetic little bear, how is she not still here being her? And speaking of missing people so much, here is a photo of Gizmo as well. I miss her calm, sweet, love. AOK Hong Kong Cafe - Ngong Ping Village, Lantau Island, New Territories, Hong Kong my name is Food. 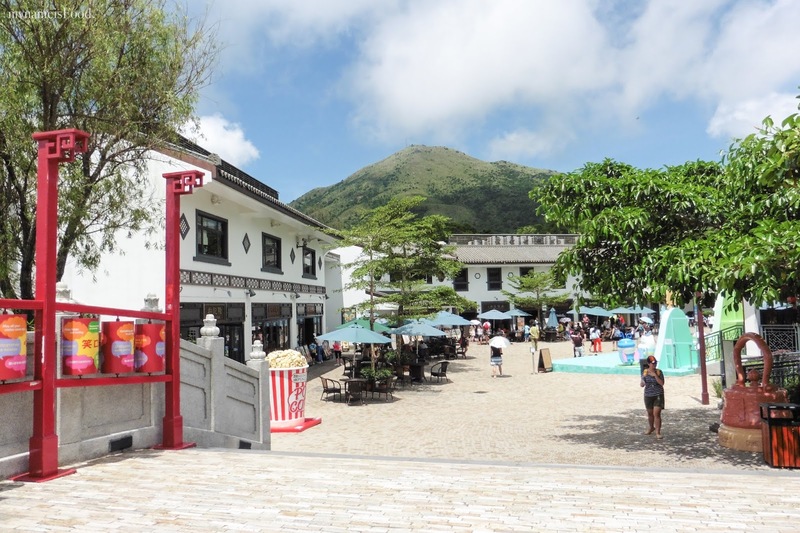 Ngong Ping Village was somewhere we wanted to go to see the Big Buddha, plus ride in the cable car ride which goes across the island allowing us to see panoramic views of Lantau Island, Hong Kong Airport and the seascape. Oh, you can also catch a glimpse of the Buddha too. Before starting our walk and hike up, we decided to have a quick meal and found ourselves in a traditional style cafe. Was able to snap a photo before it got very crowded, it was a very hot hot day indeed. 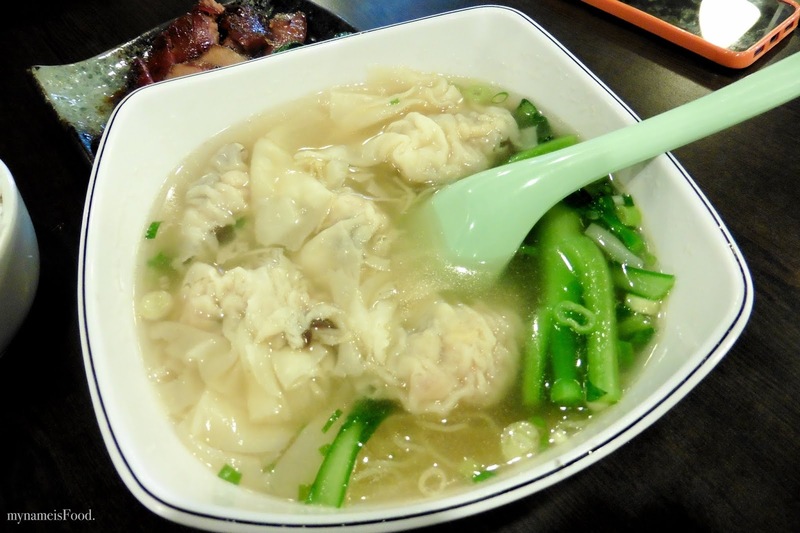 Shrimp Wonton Noodle was a warm and easy simple meal to have during our trip to Ngong Ping. The broth was not very strong in terms of taste as it tasted quite bland with a slight hint of salt. The simple chinese vegetables gave the noodle soup the crunch texture while the shrimp wonton was made quite well, not simply falling off its skin. 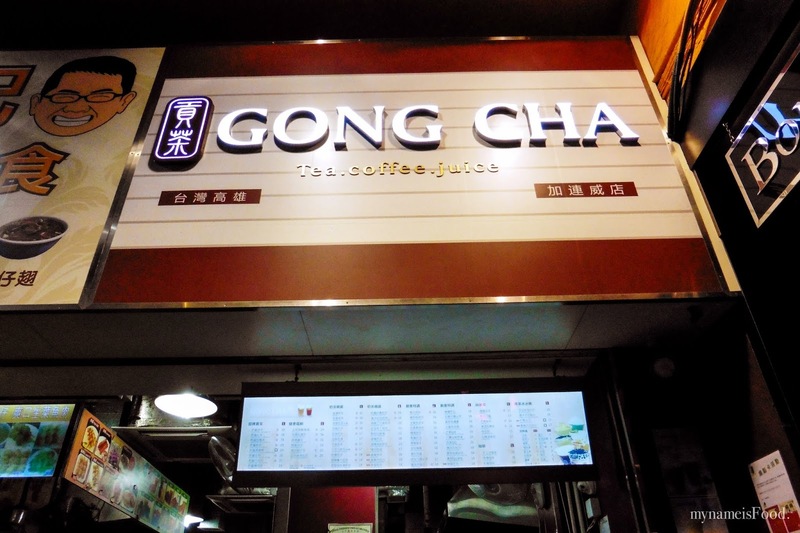 Gong Cha - Tsim Sha Tsui, Hong Kong my name is Food. OMG, we finally found a Gong Cha and just had to buy one. The price was cheaper than what we would pay in Brissie which was upsetting. It's like paying for a regular for the size of a large... gah, not wanting to think for too long since we were walking back to our hotel, we decided to just buy a large Bubble Tea. 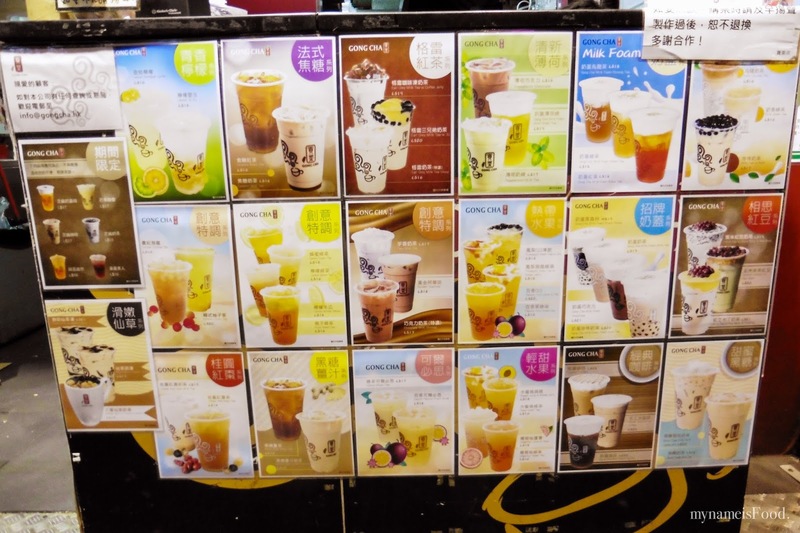 So many flavours that we havent' seen nor tasted before but we thought for comparison reasons and for equality, we thought we could just get our usual Taro Milk Tea with pearls. 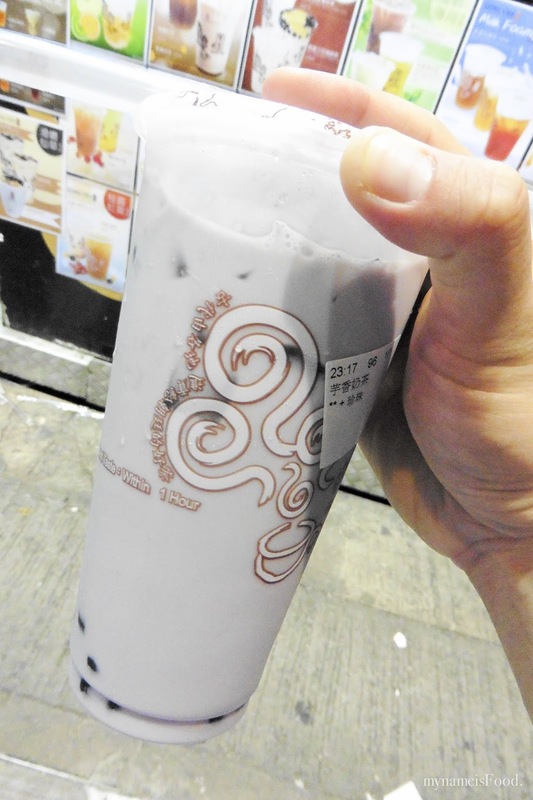 The taro pulp always adds that extra texture which we enjoyed instead of just a powdery taro bubble tea. 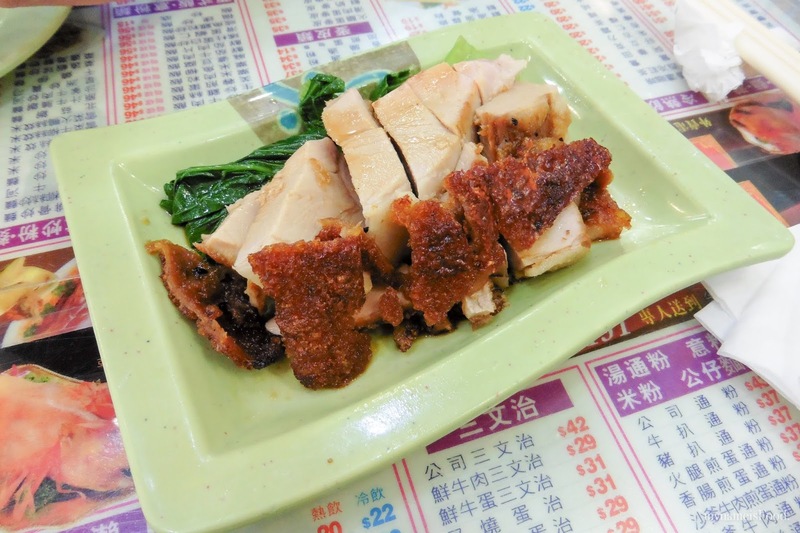 The pearls were cooked well, not too hard nor too soft, just the right consistency of chewyness. 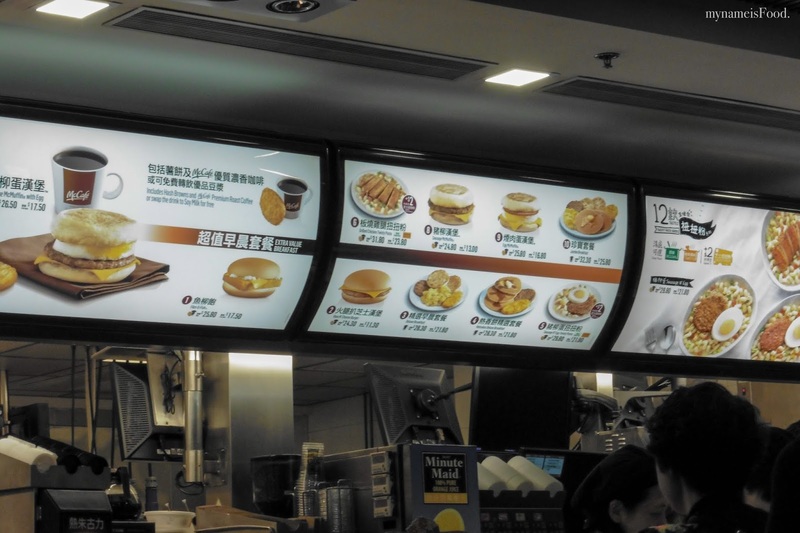 McDonald's - Tsim Sha Tsui, Hong Kong my name is Food. Whenever and wherever we travel, we always seem to make a stop over in McDonald's. Either once or twice or even for a midnight snack. There isn't a specific reason why but maybe so that we can try the different items available that we won't be able to find in down under. A few items available in Hong Kong that is definitely different would be their twisty pasta. Imagine macaroni, eggs, a choice of sausage or grilled chicken or ham served in a hot chicken or tonkotsu broth with other greens. 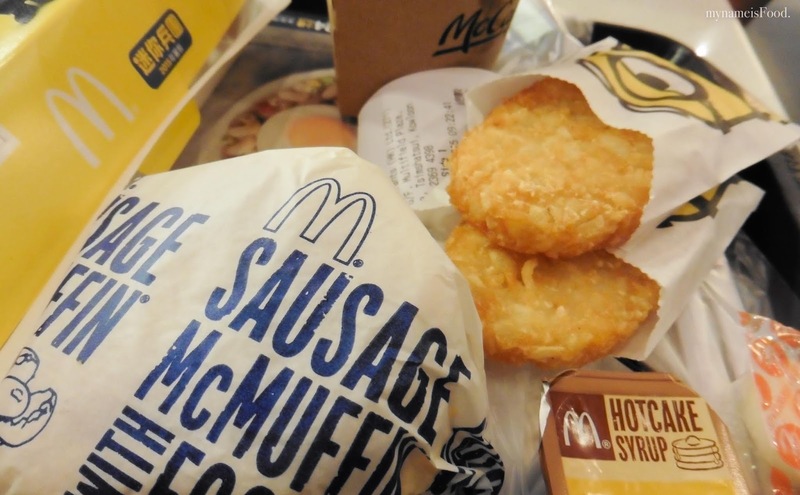 Gosh, that's definitely something you won't find..
Sausage McMuffin w Egg, a classic from one of McDonald's breakfast options. The patty however, was different to the one we're used to in Brissie. The spice in the sausage was more distinct than what I've tasted usually as a breakfast. 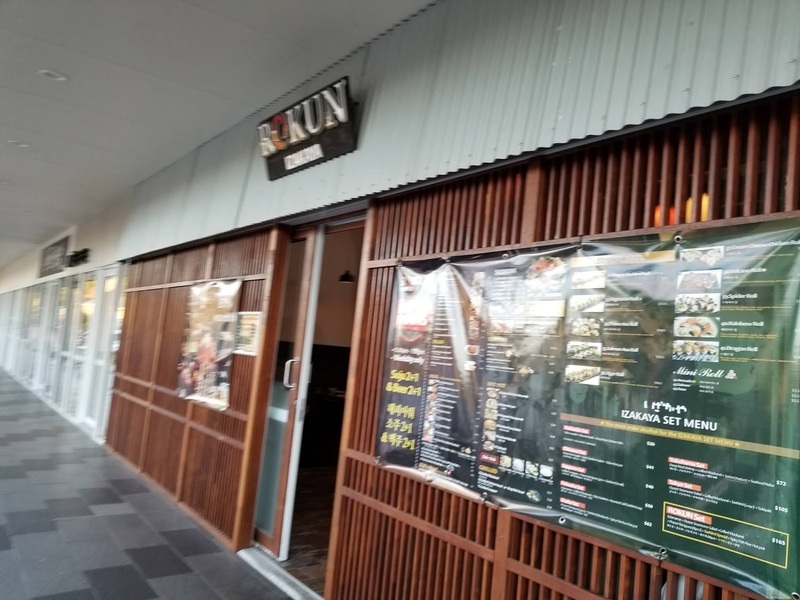 One of my board game buddies has long recommended that I try out Rokun Izakaya, a new Korean run Japanese eatery in Runcorn plaza. 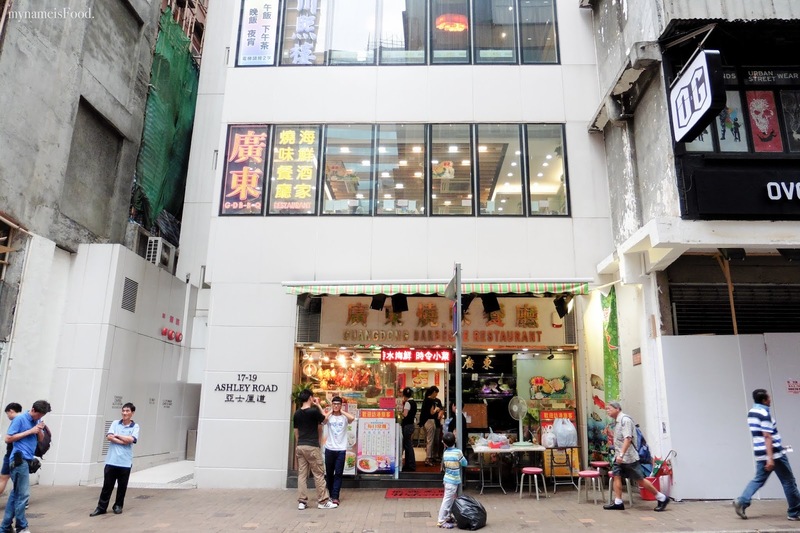 Situated next to Moge tea, it has become fairly popular, thus making it even more difficult to source a parking spot during peak hours. Nevertheless determined, I made a point to try it out. 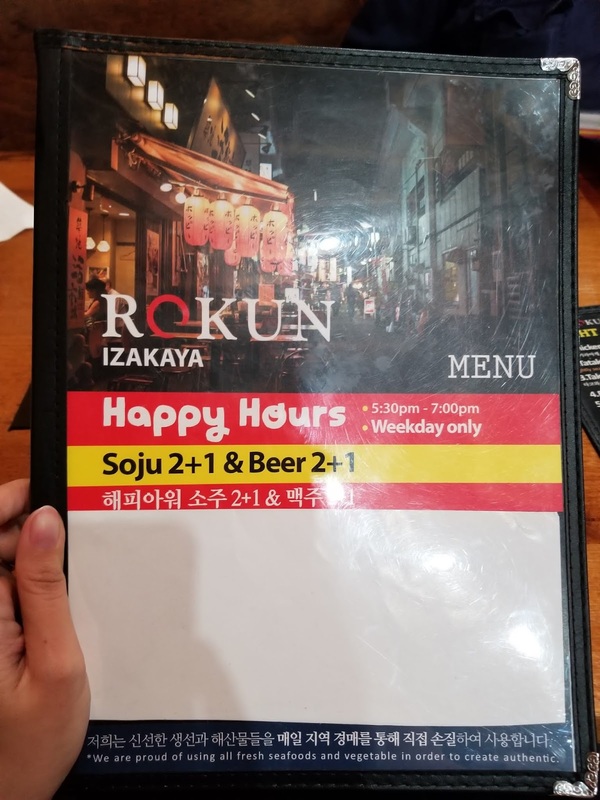 Arriving early, the restaurant was fairly empty. We were the only ones there along with another table. Service was fast. I enjoy making jams and chutneys but with only two of us in the house, it takes forever to finish a jar of anything. Even gifting does little to make a dent into stockpiles. The answer is small batch preserving. Theres no need for kilos of fruit and sugar. This Plum & Ginger Relish is ideal. A dozen plums will get you started. We had some visitors in our house over Christmas. When they departed, they left behind some fruit and vegetables. This included a dozen or so plums. Whilst plums were in the shops, it was really too early in the season for them. The plums were tart and verging on over ripe. They werent spoiled, they just werent very nice to eat. Rather than waste them I decided to make a relish to use with cheese and cold meats. Even a modest dozen plums created ample relish, with 1 huge and 2 small jars. Ive used plums but this would be equally suitable with any stone fruit including the often disappointing apricot. Like all chutneys and preserves, Plum & Ginger Relish benefits from some keeping time in the jar. This allows the vinegar to mellow and the relish to continue to thicken. Having said that, its ready to eat now, so tuck in. Its great with my Leftover Sourdough Starter Crackers that you can see in the photo above. Recipe here! 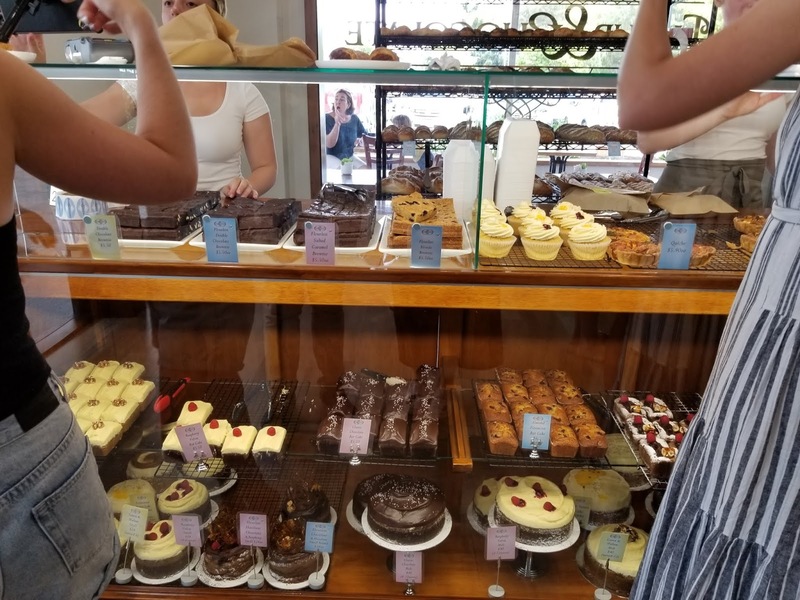 In my last post, I covered some of the meals I'd had at Yavanna, but I also mentioned that they have a great selection of baked goods. It changes day by day, so you are never entirely sure what will be there. But they always have several delicious options, some of which are also gluten free, and some of which are savoury. While I've only eating in the restaurant a few times, for a while I was in a habit of popping in for a little treat. Especially at the end of a Saturday shift! I like to get myself a treat, go home, and watch Steven Universe. A good ritual, though it has been a while since I've been. Buckle in for a trip down things I've bought lane. If one asked me to name my top five guilty pleasures, no doubt french pastries would make their way into the list. 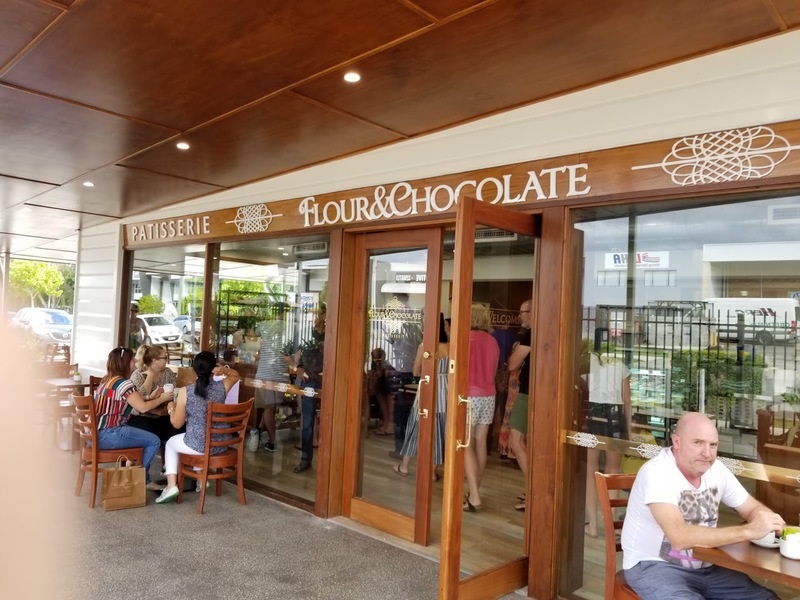 Having tried out quite a few within Brisbane, there can be no question that Flour and Chocolate are one of the best in the business. With their little store on Morningside, I try to stop by every time I'm in the area, which unfortunately isn't that often. Fortunately for Adam, they opened up a second and far more bigger store at Northgate, a quick 15 minute train ride from his place, a grueling 2 hour trek from mine. But he was super keen and wanted to support the owners, so we went on opening day. 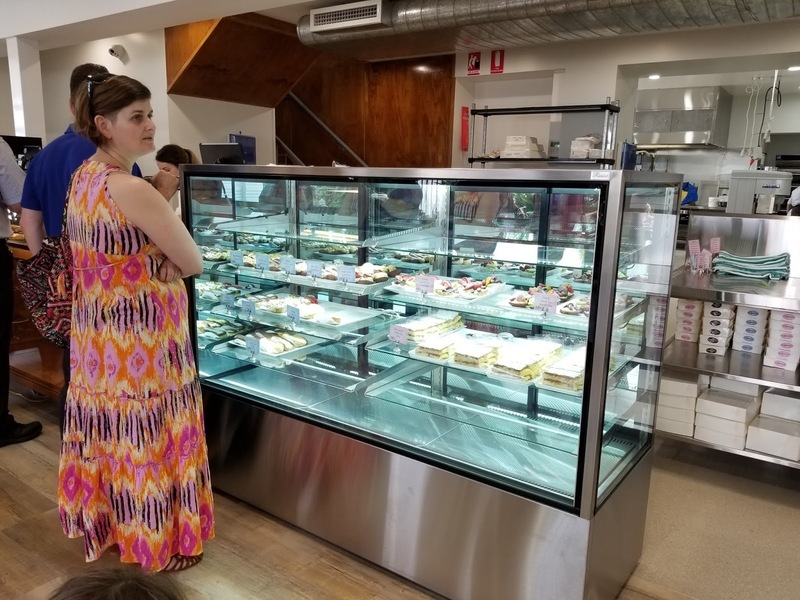 With a delicious array of baked goods, we were pressed for choice. I could tell quite a few other patrons were in the same boat as us. Ordering at the counter, service was a little confusing as there appeared to be two lines for drinks and food. Turns out you order drinks at the food counter and pick it up at the drinks counter. 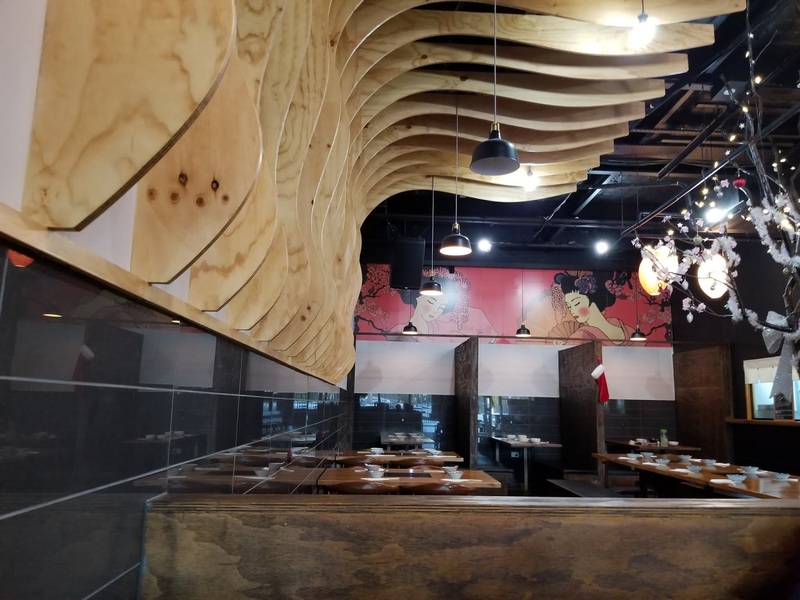 Yavanna opened earlier this year to a lot of buzz. All vegan, the focus is heavy on mock meaty and cheesy creations, with a pretty amazing selection of baked goods to boot as well as a full vegan bar. Despite it being only a five minute walk from my work, I've only been to eat there a handful of times. But the general acclaim on the vegan scene is good, and it gets super busy! 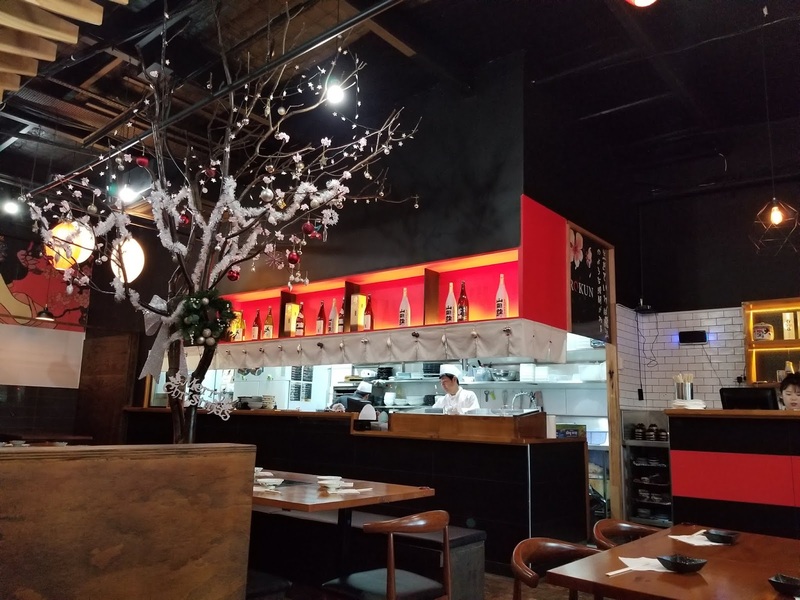 The menu has changed a few times, and they also have fortnightly specials as well. 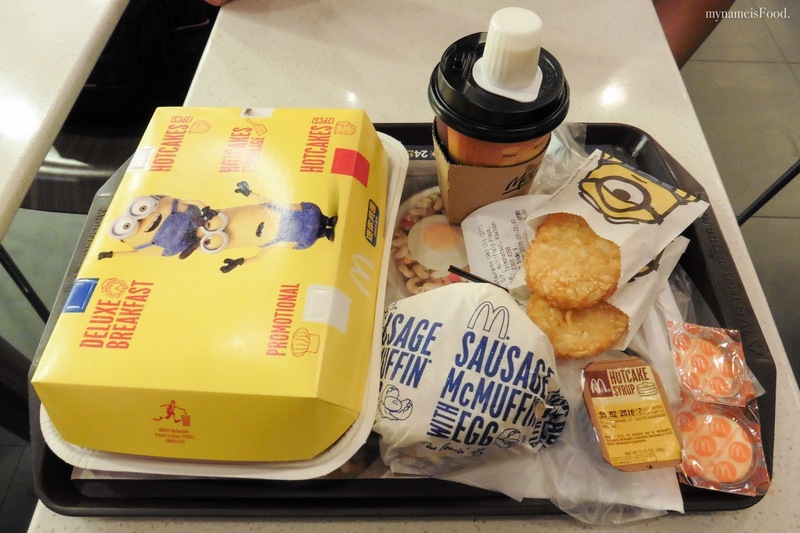 The first time I went was for lunch, and I was feeling like something a bit lighter. Lighter can be hard to find at Yavanna! I settled on the Brinner Omelet (with mushrooms, spinach, tomato, onion, and cheese... served with a side of tater tots and some guacamole), and some garlicky greens. There wasn't much mushroom or spinach in the omelet, and it could have been cheesier, but it was pretty tasty and a good texture. The garlicky greens were lovely, though a little bit on the oily side. This one time, I discovered on the Saturday morning of my weekend off that I had left my laptop charger cable at work. This was my old laptop, that wouldn't work without being plugged into the wall. So to make the trip in to work to get it seem more justified, I stopped in for breakfast at Yavanna. It was a cool day, so a turmeric latte was definitely on the cards. I am happy to report theirs is good! I ordered the Bacon Toasted Sandwich, with a side of tater tots. The side ended up being a whole bowl! This was a yummy and pretty filling and decadent breakfast! Yavanna will never leave you hungry. 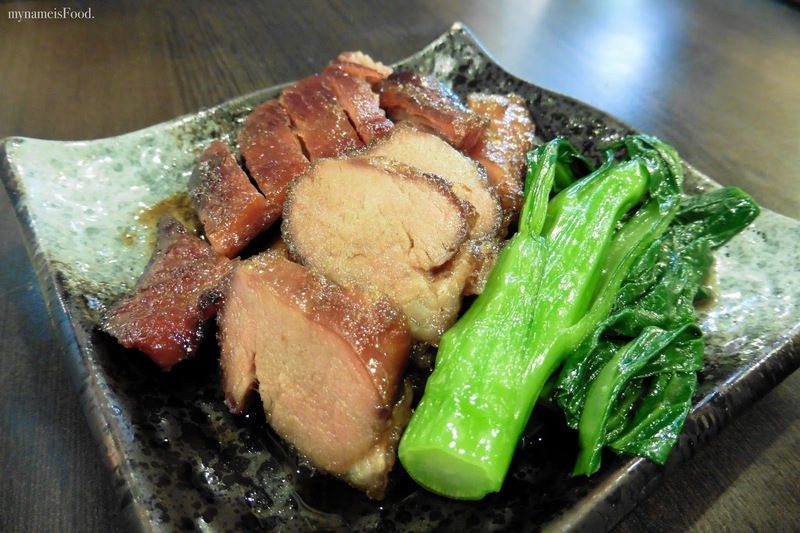 Guangdong Barbecue Restaurant - Tsim Sha Tsui, Hong Kong my name is Food. Trying to find this place was not as easy, especially if we neither of us spoke the language. We found our way however to this double or triple story restaurant tucked away in Ashley Road. We were then escorted upstairs to our table and weren't sure what to expect but knew we had to at least get one of their roasts. 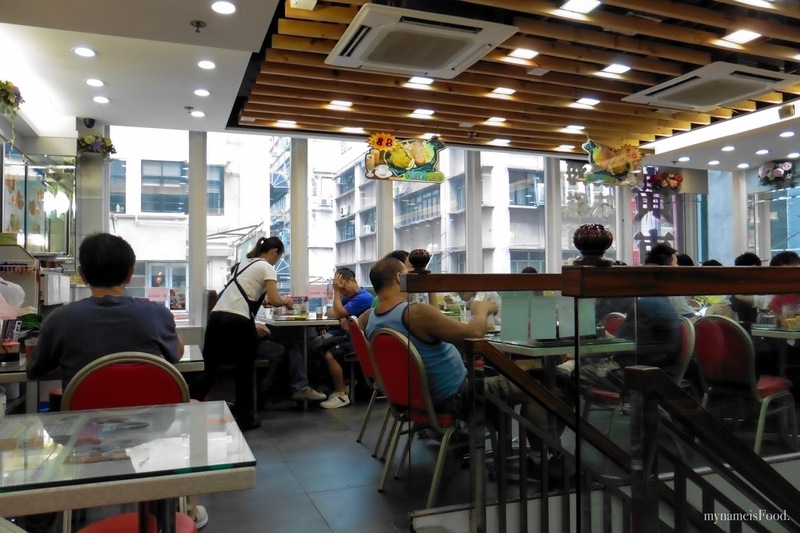 Although the place may not look the best with aircon not so cool, sweaty diners inside and finding it hard to get the waiters' attention when wanting to order, the place seemed to have been packed with people even queueing out the front. The food wasn't as good as what we thought it would be. Or maybe we just had that idea of what it would be, how it would taste and so on..
Breakfast with Keith De Lacy & me to discuss Beautiful One Day, Broke the Next "IndyWatch Feed Seq"
Former Queensland Treasurer Keith De Lacy AM and I will speak at an upcoming breakfast in West End, Brisbane on Wednesday 27 February at the Connor Court Book Room regarding my recently published book Beautiful One Day, Broke the Next: Queenslands Public Finances since Sir Joh and Sir Leo. Im very much looking forward to hearing more of Keiths insights into Queenslands fiscal history and our current situation. Keith made some great contributions to Queensland during his time as Goss government Treasurer (1989-1996), overseeing generally strict budget management and the corporatisation of government-owned businesses, among other achievements. Since that time, Keith has had a distinguished business career and is a former President of the Queensland division of the AICD. NEW IPSWICH STALLHOLDER PROFILE FOR MY HOUSE OF CRAFT "IndyWatch Feed Seq"
Feb 2019 Permaculture Design Course "IndyWatch Feed Seq"
The post Feb 2019 Permaculture Design Course appeared first on Northey Street City Farm. Local Trivia "IndyWatch Feed Seq"
Very local! around my house and yard! After the big hail storm it took me a little while to discover the amount of damage that had been done to the trees and plants around my yard. 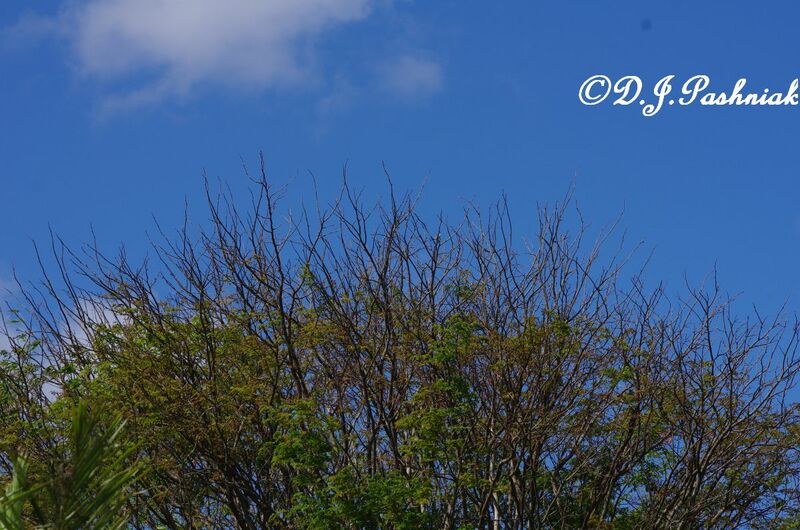 This Leopard Tree is mid way across my back yard and very visible from my back window. Every year it loses some of the leaves but this is what the hail storm did - I could get a good view right through all the leaves and see all the birds that usually hide somewhere in there. 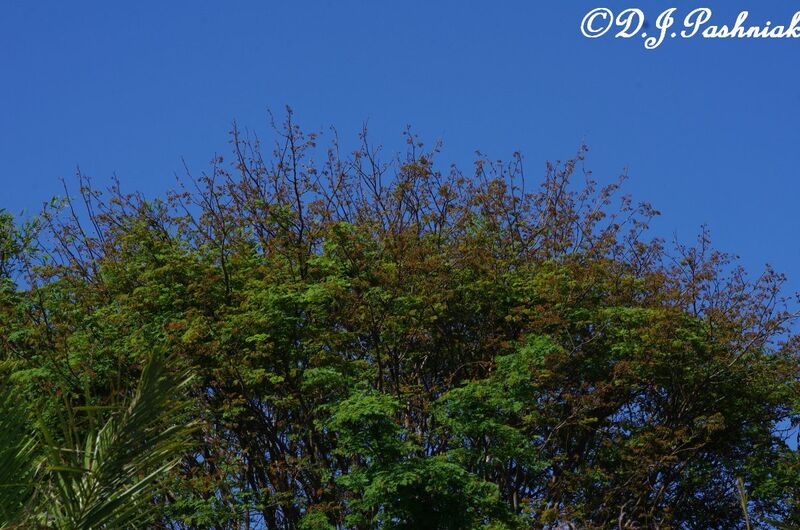 Slowly the dead looking branches flushed with new color and soon after that leaves covered everything again. This palm tree is in front of the Leopard Tree and shows the hail damage. 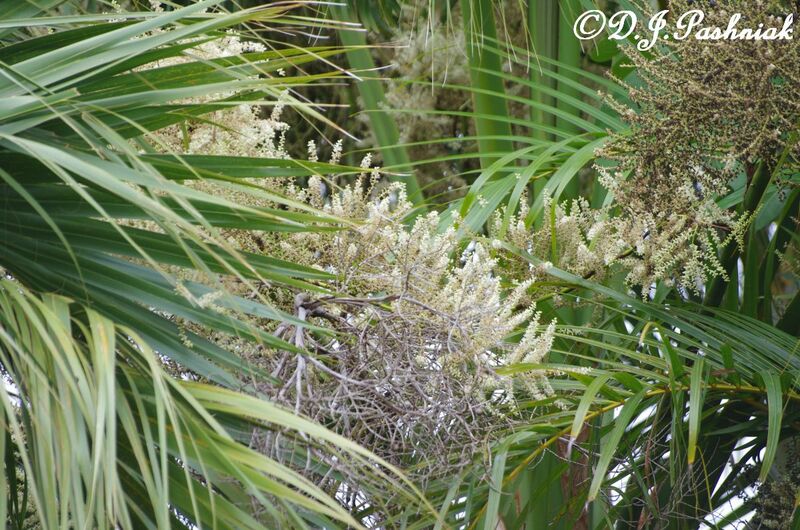 Some of the fronds were totally dead - many more badly shredded and right in the middle is a new green frond. 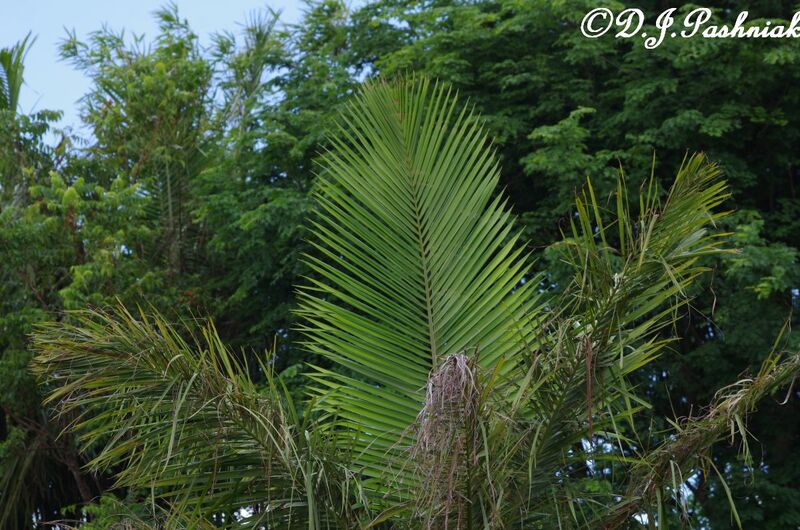 However it will take a while for some of the palms to look really good again. It was the palm trees out the front garden that were the most surprising. I assume it was a response to the severe weather and then the soaking rain we got a few days later. They all put up flower stems and then set seeds at a similar time. The Duke of Sussex St I "IndyWatch Feed Seq"
The Duke of Sussex officially marked the arrival of Invictus games by raising a flag on Sydney harbour bridge. I have marked the occasion by having a closer look at places in Australia named Sussex. So far, Ive counted over 60 places in Australia, called Sussex. Most of them are streets. And, Ive counted 26 different Aboriginal nations, which have the name Sussex mapped onto their Country. Among all these places named Sussex, there are a couple that look like specific references to a Duke of Sussex. Im looking at an old sketch of the Town of Sydney made around the time that Thomas Brisbane arrived there, to be Governor of NSW. Its got a Sussex St. It also has the Government Garden marked out. That was the venue for the cycling on Sunday. The Sussex St refers to the first duke of Sussex, Augustus Frederick, son of George and Charlotte. On this map, the Duke is presented as part of a family his Mum and Dad get some streets named after them and so do his brothers the Dukes of Kent, Cambridge, York, Clarence, Cornwall, and Cumberland. 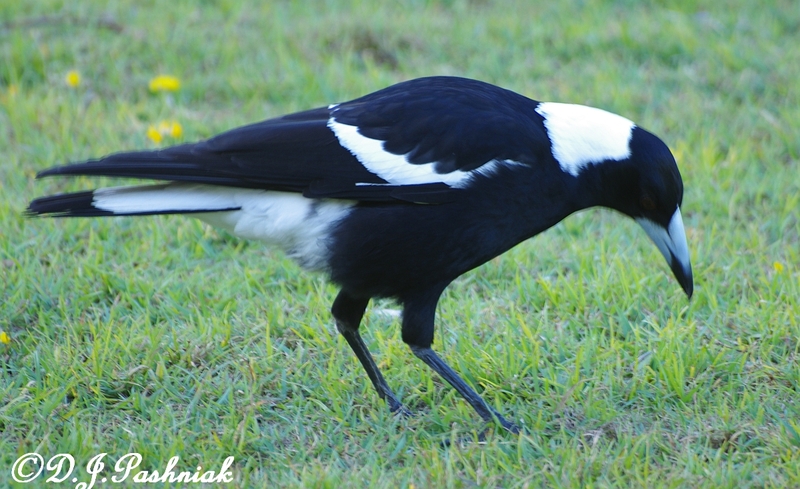 Australian Magpie "IndyWatch Feed Seq"
Winter in Queensland "IndyWatch Feed Seq"
I think I have been reading too many posts about gardens and flowers and fresh veges up in the northern hemisphere. I do wish that my garden looked lovely and tidy again but I am NOT a dedicated gardener - and when energy levels are low it is way down on my list of important things to do. So things kind of get along by themselves and because this is SE Queensland they just grow a little bit slower in the winter, The climate here is very nice except when it gets a bit cold at night and then I have a whinge about it!! 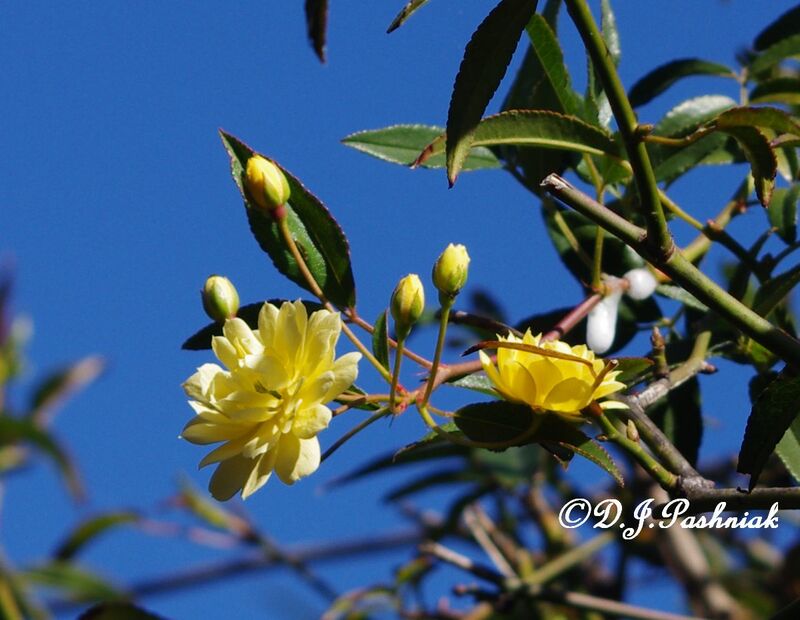 I planted two banksia roses outside my kitchen window and they are just now starting to flower. The yellow one has fewer flowers but they are bright and beautiful. 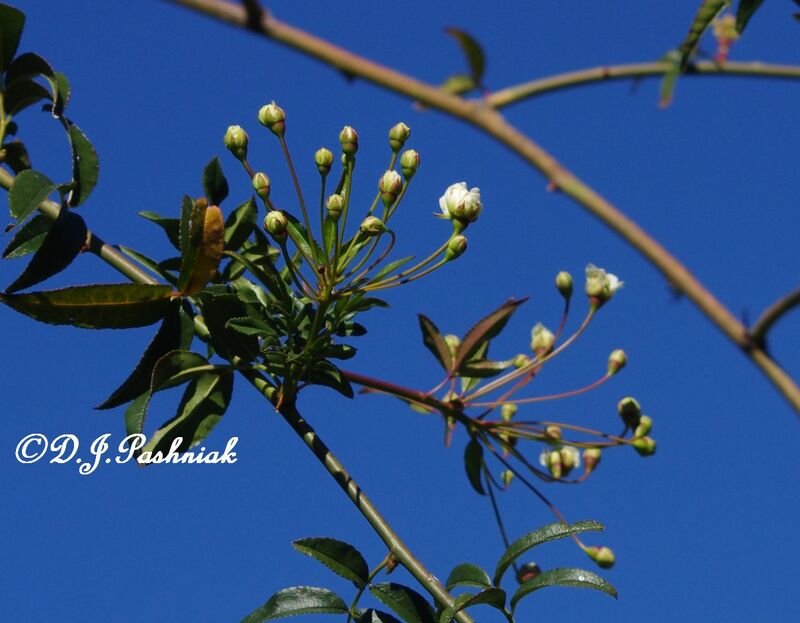 With buds like these the white flowering one should look good soon. A whole flock of sparrows came and twittered and fluttered in there close to the window but as soon as I moved to get the camera they were gone. I am not having too much luck with bird photos recently. 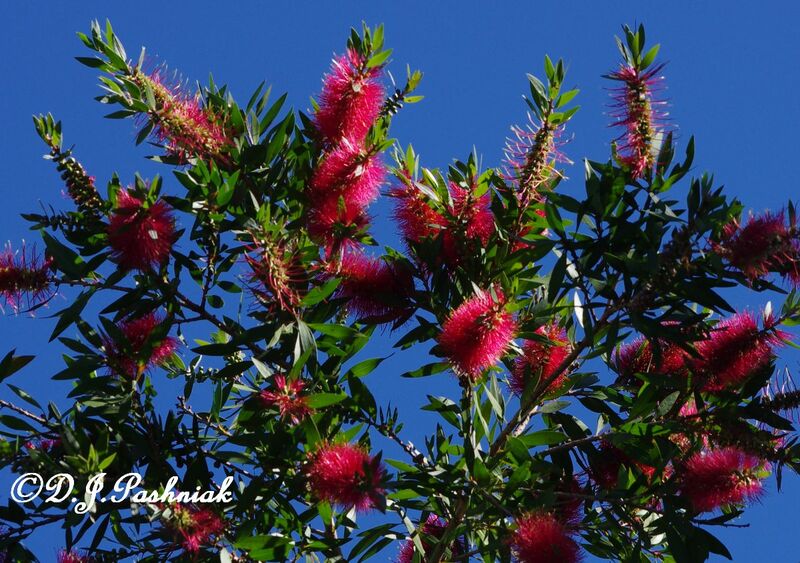 I planted a number of "bottle-brush" trees along the sides at the back of the yard and they always look good when they flower. Also the birds love them but unfortunately those birds are usually LBJ's (little brown jobs) that do not sit still to have photos taken. 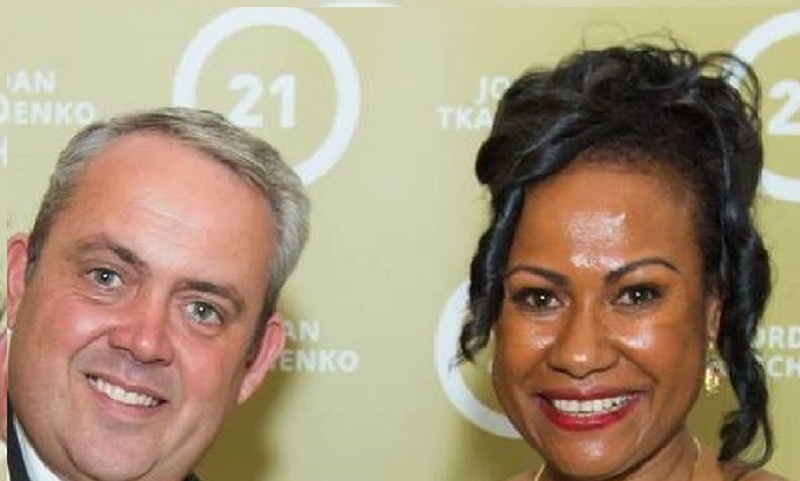 JUSTIN TKATCHENKO FOOLED EVERYONE, EM PASIM AI BILONG YUPLA "IndyWatch Feed Seq"
Renovations to New Farm Neighbourhood Centre "IndyWatch Feed Seq"
Plans are underway to renovate New Farm Neighbourhood Centre. New Farm Community Centre has been a part of your community for 32 years. Established in 1986 and providing a wide range of activities such as counselling, support network services, play groups, yoga, art classes and so much more. New Farm Community Centre has been a friend of this community for so many years, and now the centre is being revitalised thanks to funding from the Queensland State Government. Two additional meeting and consultation rooms. Oxley Creek Transformation Project Draft Master Plan "IndyWatch Feed Seq"
Oxley Creek Transformation Pty Ltd (a wholly-owned subsidiary of Brisbane City Council) has prepared a draft Master Plan for a $100 million Project to revitalise this corridor, transforming it into a world-class green lifestyle and leisure destination. to direct rehabilitation efforts to ensure environmental benefits across the whole of Oxley Creek corridor. environmentally friendly economic hubs within, and along the edge of the Oxley Creek corridor will help fund its ongoing transformation. The OCCA Management Committee will release a statement next month, following a thorough review of the draft Master Plan and committee discussions. 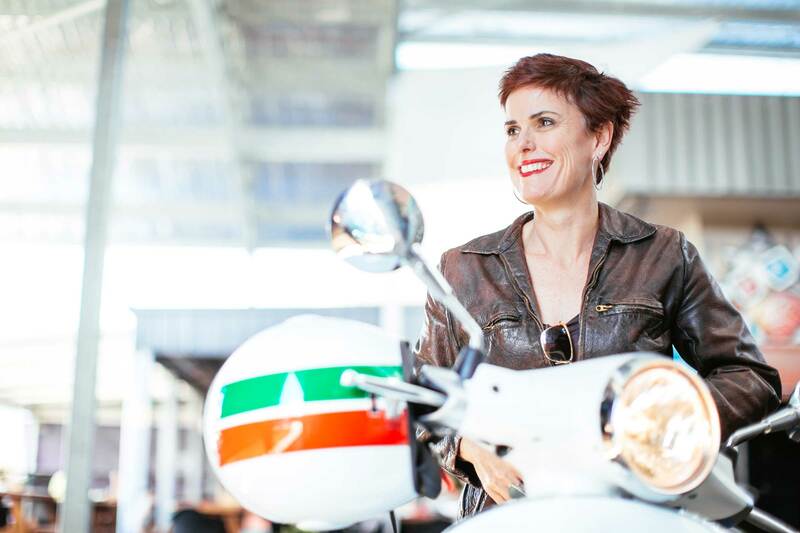 Some like it HOTA: The Gold Coast gets innovative and edgy "IndyWatch Feed Seq"
Criena Gehrke, CEO and director of HOTA: Home of the Arts. Photo supplied. Things are changing on the Gold Coast; its no longer the cultural vacuum that many joked it was decades ago. These days, thanks to the investment of The Gold Coast City Council, this coastal city is quickly making its name as an impressive arts hub. Just last weekend the council gifted the community a free Tim Minchin concert to celebrate the opening of the beautiful new 3,500-seater outdoor amphitheatre. The Gold Coast Arts Centre has been renamed to signal a new direction and new commitment to the arts and the Gold Coast and hinterland community. HOTA: Home of the Arts. Standing front and centre is Criena Gehrke, CEO and director of the precinct. Hailing from Melbourne, Gehrke relocated four years ago and was instrumental in developing the citys cultural contract. Gehrkes background in theatre, and her passion for site-specific work and community engagement is evident in the upcoming programming planned for HOTA this year. Part of what we are committed to here is creating a great place of community.Part of the change is that the Arts Centre has been a great and well-regarded arts centre and when you grow it into an arts precinct it has to be an experience. We have a lake, a parkland, and facilities come and swim in the lake, get your feet sandy, come and see a show. This is a place where art meets life. Gehrkes vision is a less passive way of viewing art. Its about community getting engaged and involved in what is presented. I would hate to see the demise of the proscenium arch play, but you have to encourage people to engage thats our ambition to be a platform for great national and international artists and our home-grown artists. It seems too good to be true. A council that actually values arts and culture? Bulimba's wildlife surviving in suburbia "IndyWatch Feed Seq"
Small-leaved lilly pilly, INSET: Australasian figbird (male), Bulimba. A sunny afternoon spent in Bulimba last Thursday afternoon offered up some great encounters with a variety of reptiles, birds and insects. Parking near the main shopping and dining precinct along Oxford Street, I explored the shady edges of the adjacent Memorial Park first, finding a gravid dark bar-sided skink (Concinnia martini) outside her hideaway in a fig tree hollow. Little friarbird (Philemon citreogularis), Bulimba. Elsewhere in the park, a straw-necked ibis (Threskiornis spinicollis) performed free sportsfield maintenance for the community, using its long bill to reach at grubs eating the grass roots. I then walked down Godwin Street en route to another park, noting a beautiful small-leaved lilly pilly (Syzigium luehmannii) fruiting beside the footpath. 2017 CALENDAR UPDATES "IndyWatch Feed Seq"
Mini Twich - to raise monies for a conservation cause. The idea is to see and / or hear as many bird species as possible between the hours of 7am and 6pm on Saturday October 14 anywhereon the Sunshine Coast. Minimum team size 2 maximum 4. Make your own team or just turn up on the day and join one. Participation cost? $20 per person suggested. One of the Councils new reserves - Scarffe Road Glenview. This reserve is fenced off and not open to the public, it includes a large quarried lake including adjoining maintenance roadways and is surrounded by riparian rainforest. It also adjoins existing Mooloolah River Esplanade Reserves. The entrance gates are located at the end of Scarffe Road before the bridge (private property), there is plenty of parking along Scarffe Road. Enter Mooloolah Connection Road off Steve Irwin Way, then enter Scarffe Road (WHICH IS NOT SIGNPOSTED) off Mooloolah Connection Road at Glenview. Scarffe Road is the first road on your right. If you have reached Stevens Road you have gone approximately 300 metres too far. Public toilets are located about 1.3 kilometres down Mooloolah Connection Road at Ewen Maddock Dam Reserve. Advanced notice of our October weekend outing. "IndyWatch Feed Seq"
We will be conducting a Mini Twich to raise monies for a conservation cause. The idea of course is to see and / or hear as many bird species as possible between the hours of 7am and 6pm on Saturday October 14. AUGUST MID WEEK WALK "IndyWatch Feed Seq"
The mid week outing for August is happening on the 16thAugust at the Maroochydore Botanical Gardens. The walk will be led by Vince Lee. Please arrive at 7-45am so as to ensure an 8am start. As usual please bring a chair and morning tea. Be sun smart. The Maroochy Botanical Gardens are located at Tanawha. The Maroochy Bushland Botanic Garden comprises 82 hectares of lush forested areas and is located off Tanawha Tourist Drive. The gardens are a place of natural beauty, where visitors can come for a peaceful stroll and relax as they walk through the fern gullies and past the on-site lagoon. Forthcoming Outings "IndyWatch Feed Seq"
A quick up-date regarding forthcoming outings. There is a mid week outing on Wednesday, July 26 to Ben Bennet Botanical Garden in Caloundra led by Vince Lee. Please meet at the Queen Street entrance at 8am. Remember to bring morning tea, water etc. 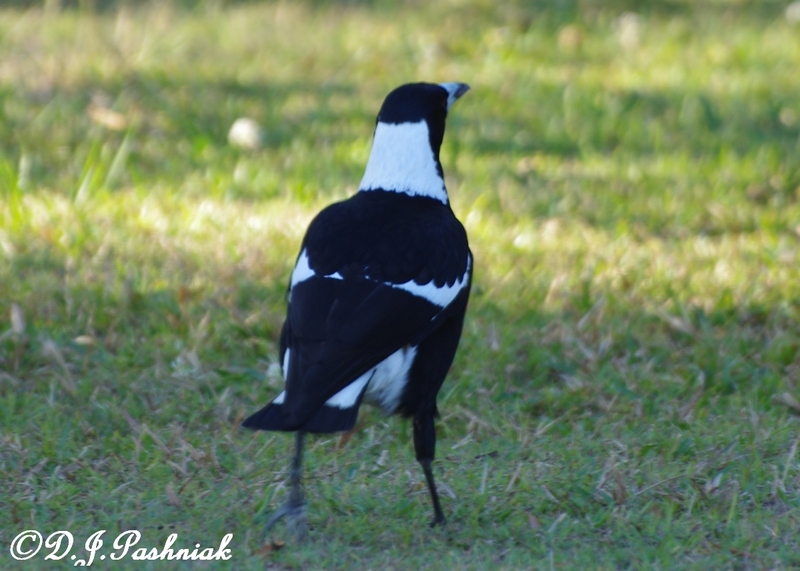 Good opportunities for birding after in and around the Caloundra headlands. No RSVP necessary. Notice too for a week end away for the weekend of 18, 19 and 20 of August. The plan is to depart Nambour c5-30pm on the 18 for Esk. Saturday would involve a day trip to Lockyer Valley a variety of habitats which promise a suite of many species uncommon or impossible on the Sunshine Coast. Sunday will have a mornings birding close to Esk before driving back to the Sunshine Coast in the afternoon. Cost tba, however it will be in the $150 ball park I imagine, depending on numbers. The price will include transport, accommodation and lunches on Saturday and Sunday. Please register your interest asap as it is a case of first in best dressed. Our Saturday August outing will be to Sheep Station Creek details to follow. 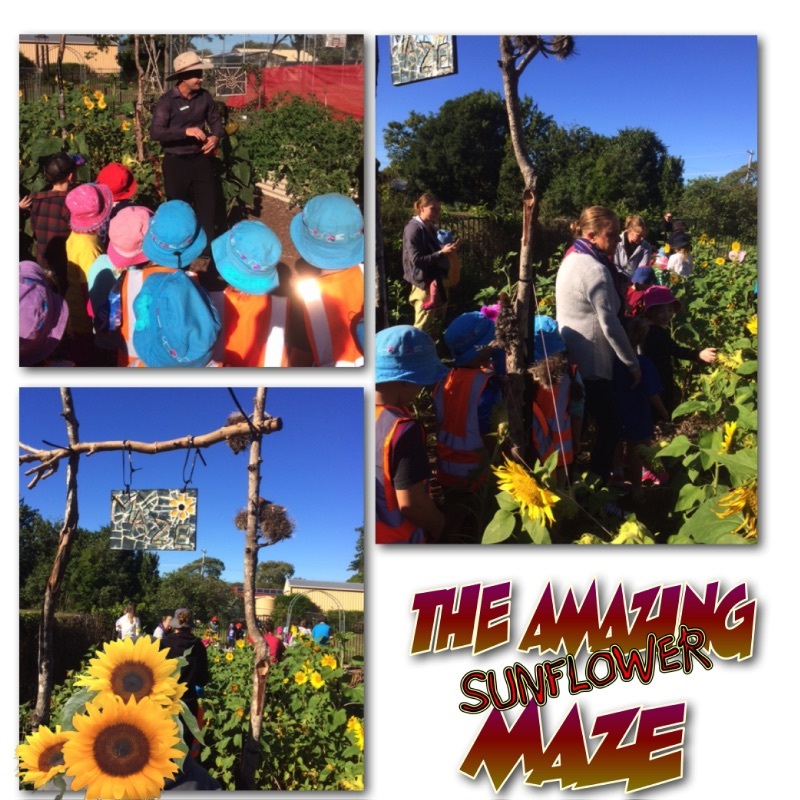 Sunshine Coast Birdlife Australia Blog "IndyWatch Feed Seq"
SunFlower Maze "IndyWatch Feed Seq"
We had an 'official'* opening of the Beachmere State School Sunflower Maze today, with preschooler and kindergarten guests. The young tourists planted some tomatoes and munched through some of our cucumber harvest. Maze planted and nursed by the primary school students in the school garden and students from Years 5 and 6 conducted the youngsters through the maze (in case we lost any**). The Maze will persist as a perennial Vetiver grass maze over the next few years. Parents can access the Maze on Tuesdays and Thursdays mornings. * BSS Principal, Brad Geisel, cut the ribbon. ** No children have permanently been lost in the Maze. The Cart Community Coffee "IndyWatch Feed Seq"
The Cart Community Coffee is a socially inclusive coffee hub, at which people from within the wonderfully diverse community that is the New Farm peninsula can come together over an excellent cup of coffee. The New Farm Neighbourhood Centre has always provided a welcoming and relaxing place for people to meet and tap into local support services. The Cart Community Coffee extends that welcome by providing somewhere where people can pass time with friends in a safe and relaxing environment. It also creates employment opportunities for those without work by training them to work as baristas. Neighbours, commuters, passers-by and other members of the community are invited to stop and share a coffee in the gardens or to pick up a take-away on their way past. When you buy a cup of coffee you have the choice of spending a little extra to pay a coffee forward for someone who is unable to buy one. Open every day 6am-12pm, New Farm Neighbourhood Centre, 967 Brunswick St New Farm. View the menu and price list here. The Cart Community Coffee is an initiative of the Patrons of New Farm and made possible with the generous support of Merlo Coffee and Communify. Book in. Volunteer at the Beachmere State School. Help grow kids. "IndyWatch Feed Seq"
Here's your chance to help out the young in our community.